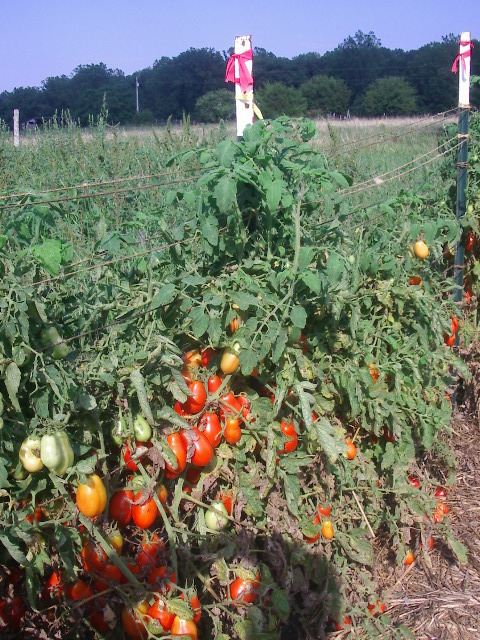 Roma paste tomatoes in mid-August, with stakes flagged for seed collection. August is my busy month for seed harvesting. 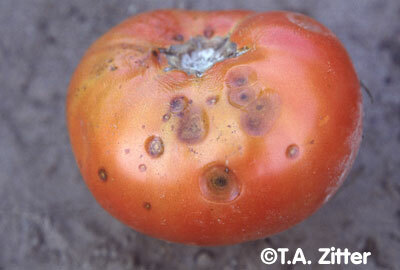 I alternate tomato seeds and watermelon seeds, getting one batch of each done each week. 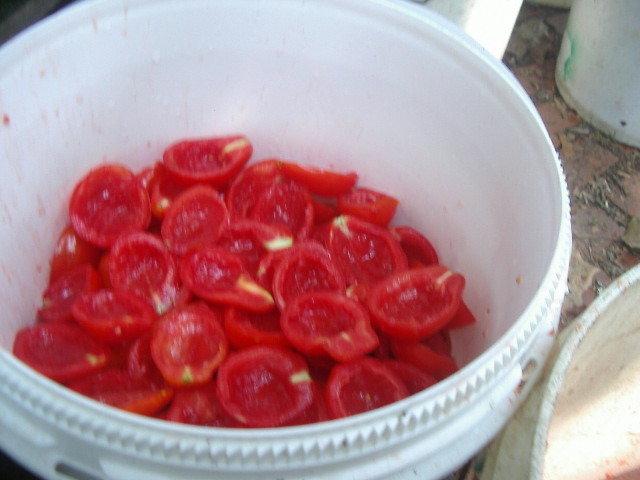 Today (Tuesday) I packed away a dried batch of Roma tomato seeds and washed and set to dry a batch of Crimson Sweet watermelon seeds. These are both the Virginia Select strains which I sell to Southern Exposure Seed Exchange. 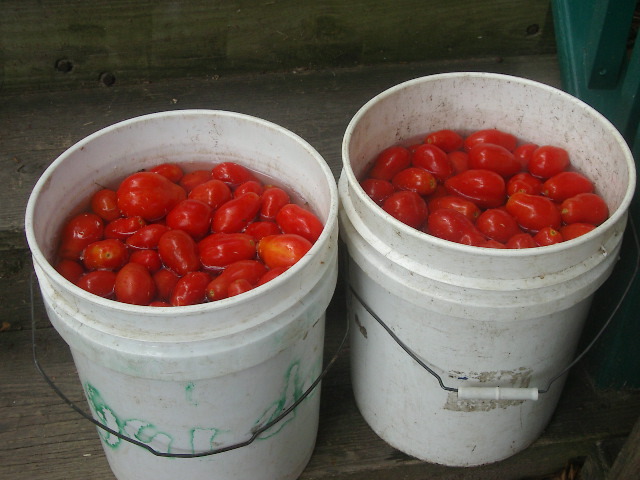 I harvested two buckets of Romas on Thursday and left them to fully ripen until today (day 5 for those not counting). Each year since 2001, I’ve been selecting the Romas for earliness, productivity and resistance or tolerance to Septoria leaf spot disease. In the photo above you can see pink flagging tape on two of the T-posts and yellow on the nearer one. Pink flagging tape marks the plants that had large early yields and OK foliage. 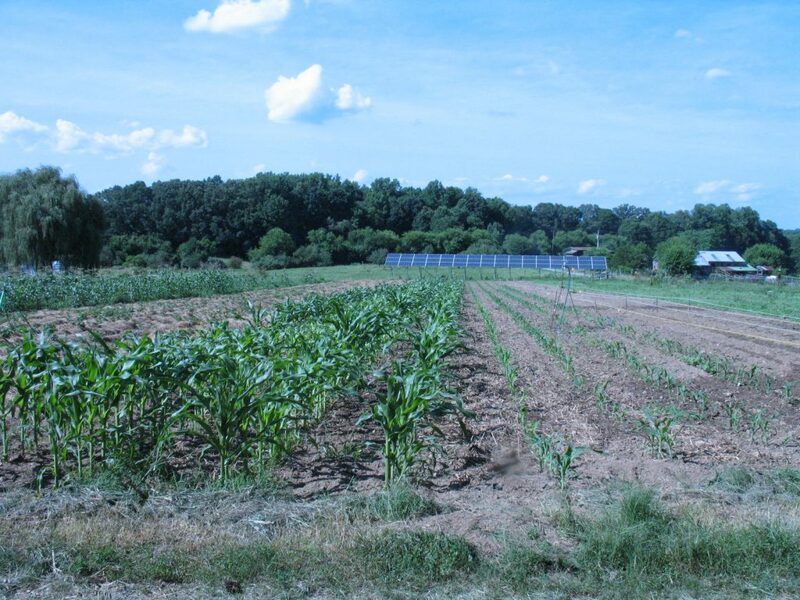 Yellow tape marks the plants that have healthier foliage and at least average early yield. Roma tomatoes getting washed ready for seed extraction. 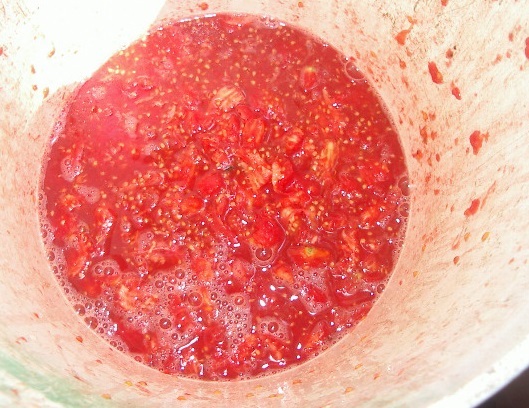 Today I processed the two bucketfuls of Romas from Thursday for seed. I like to do this task on the porch steps as this gives me various heights for the different buckets, and reduces bending double. 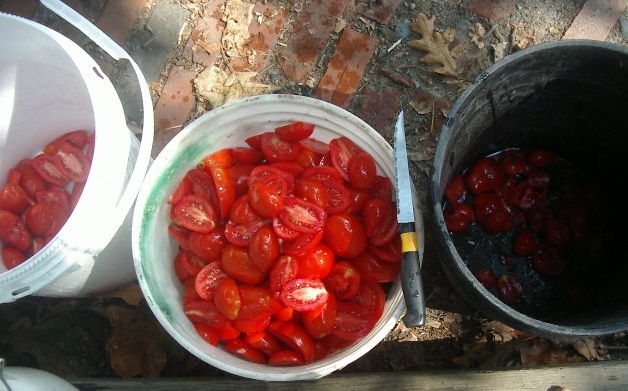 The next step is to cut each tomato in half lengthwise, pitching any rotten ones in a compost bucket, and putting the good halves in a clean bucket. 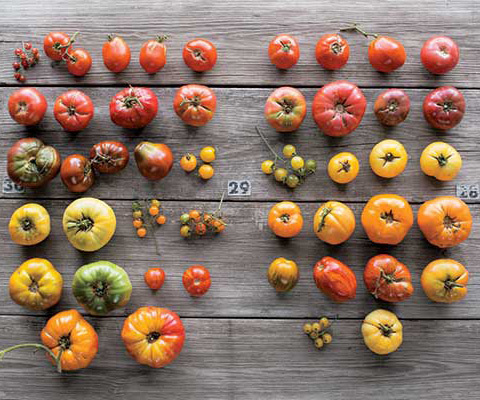 Roma tomatoes cut in half for seed extraction. 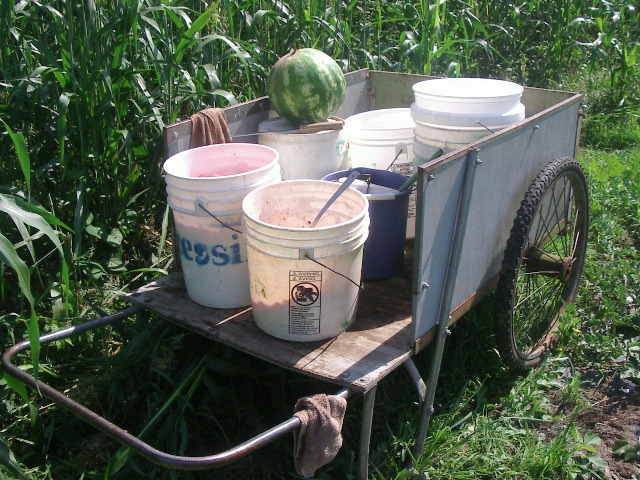 In the photo above, the compost bucket is on the right and the food bucket on the left is getting any edible parts that I don’t want to save seed from for one reason or another. 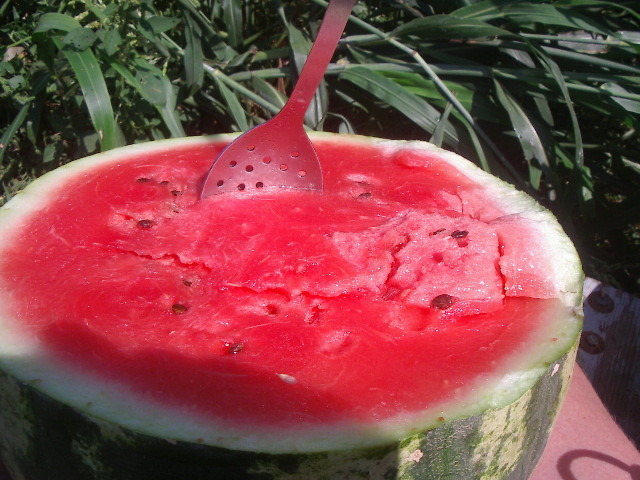 For instance, if the end of the fruit was bad, I don’t want seed from it in case the disease is also in the seeds, but the rest of the fruit is perfectly edible. For the cutting I like a small serrated knife, as shown in the picture. Roma tomatoes with the seeds removed, all ready for making sauce or salsa. Next I use a soup spoon to scoop out the seeds into a smaller bucket and I put the scooped out halves (“shells”) into another clean bucket. I’ve trained myself to keep moving on this task and only scoop once in each half tomato. I don’t go back for one odd seed that got away! The “shells” are then all ready for cooking into sauce, or chopping and making into salsa. The seeds bucket gets a loose lid and is put in a cool dark corner of the shed for three days (until Friday). 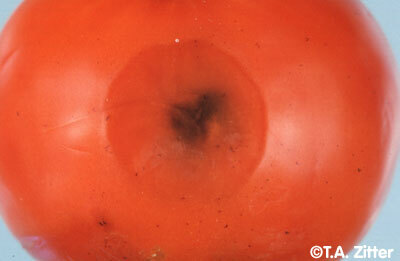 The goal is to ferment the tomato seeds, which kills the spores of some of the diseases, and makes it easier to remove the gel around the seeds and the bits of tomato flesh. 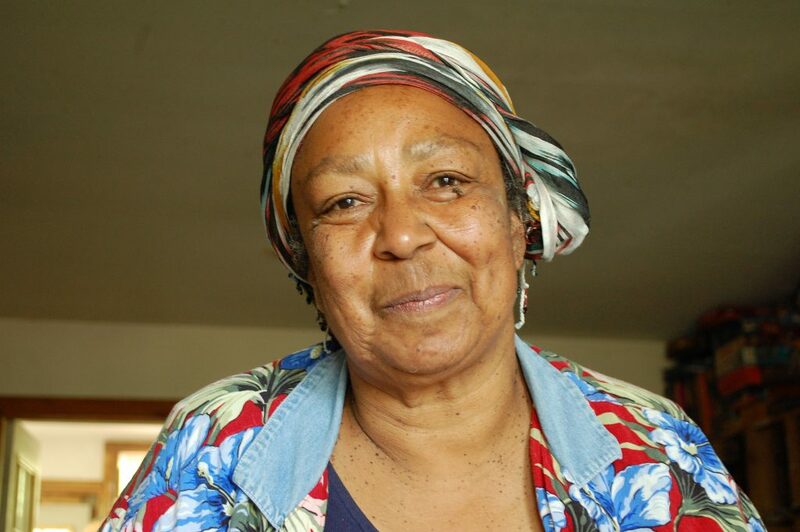 I stir once to three times a day to let the carbon dioxide escape, and to break up any surface mold that develops. 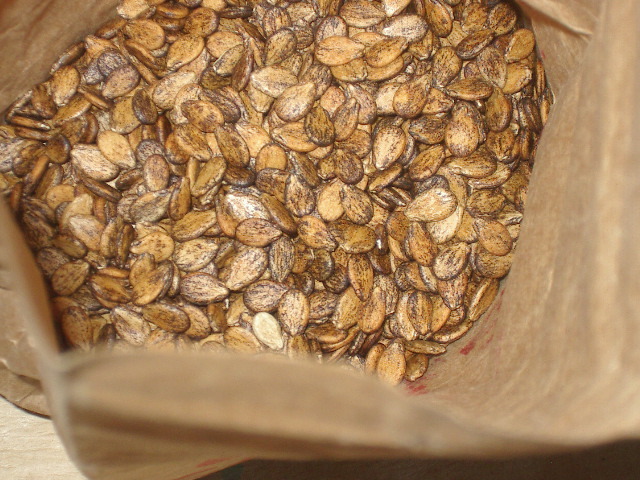 After three days I wash and dry the seeds. Roma tomato seeds just after extraction from the tomatoes. I like seed crops where the food part is also harvested (or most of it). 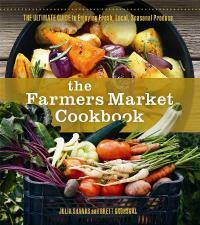 Peppers and melons are that way too, but not crops that we eat botanically immature, such as eggplant and cucumber. 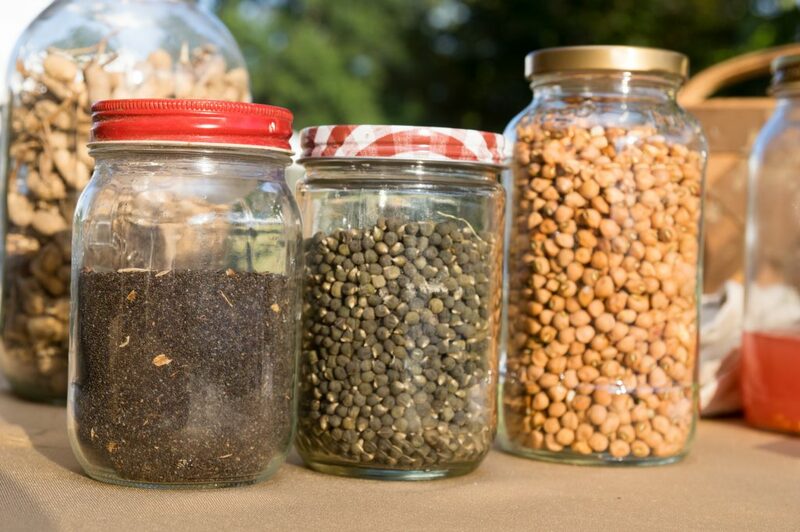 And obviously not crops where the seed is the food crop, such as peas, beans and corn. Cold-hardy Outredgeous lettuce at an adolescent stage. We’re just about to get our first real frost, and our lettuce planting has moved indoors, while our lettuce harvesting is straddling outdoors and indoors. 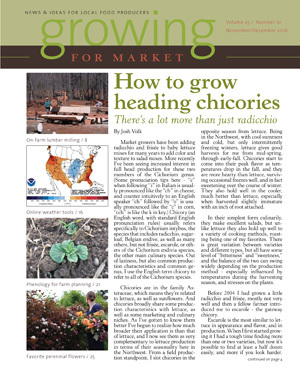 As I reported in September, we had cutworms eating our outdoor lettuce seedlings. We sowed (and resowed on 9/16) some outdoor baby lettuce mix to play catch-up and help feed us salads until the hoophouse lettuce are ready. Yesterday, day 38 since sowing, we cut our first lettuce mix. We could have started a few days earlier. We have had a warm spell, which helped them grow faster. Because we usually only grow lettuce mix in our winter hoophouse and hadn’t planned to sow the mix outdoors, we didn’t have enough “official” lettuce mix seed. 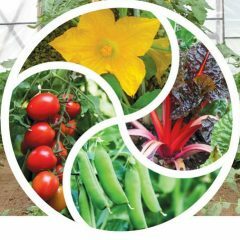 I simply made a mix of seasonally appropriate leftover fall varieties that we wouldn’t need for the second hoophouse sowing on 9/24. For those unfamiliar with baby lettuce mix, this is a cut-and-come-again crop. 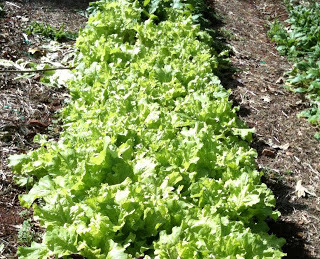 We like Fedco’s 2981LO Lettuce Mix OG or Johnny’s Allstar Gourmet Lettuce Mix #2310. For those with challenging growing conditions, both companies offer other specialized selected mixes. 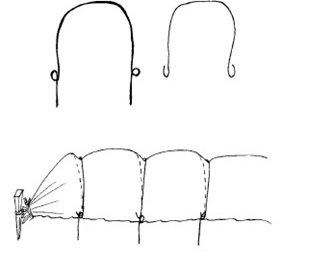 1 ounce of seed sows about 600 ft, and you can sow rows 4″ (10 cm) apart. 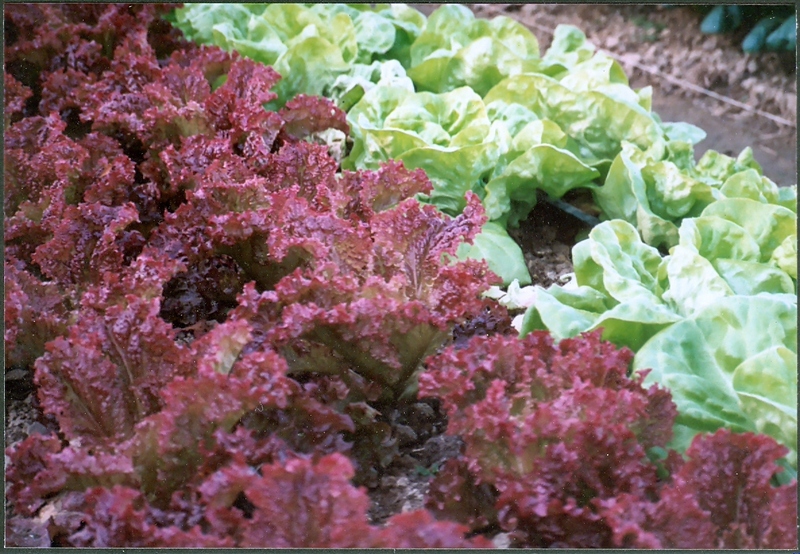 Here’s how we grow baby lettuce mix: We weed and thin to 1″ as soon as we can see the seedlings well enough to do so. 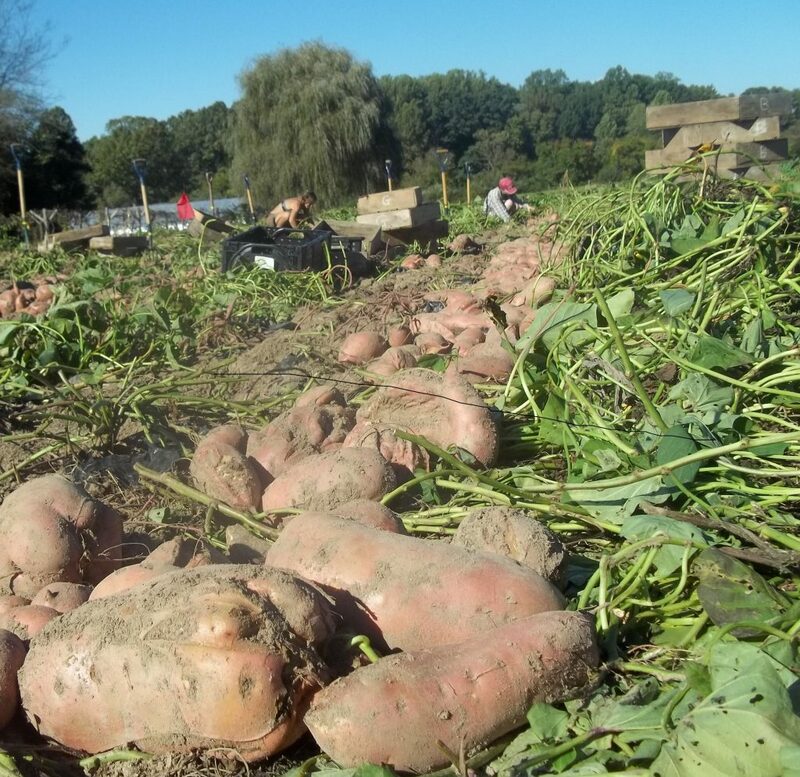 Once the plants are 3-4″ tall, we cut them about an inch above the soil, with large scissors or shears. I usually gather a small handful with my left hand, cut with my right. After putting the harvested leaves in a crate or bucket, I weed the just-cut area so that there won’t be weeds in the next cut. I have also read the recommendation to rake over the rows after harvest with a fine leaf rake to remove outer leaves and cut scraps. If you want to make more than one cut, you will need to remove anything that isn’t top quality salad while you can see it. Yesterday, as well as the baby lettuce mix, we made up our salad mix with spinach which we had sowed in the hoophouse 9/7, and brassica salad mix sown in there 10/2 (which was already plenty big enough to harvest after only 20 days. 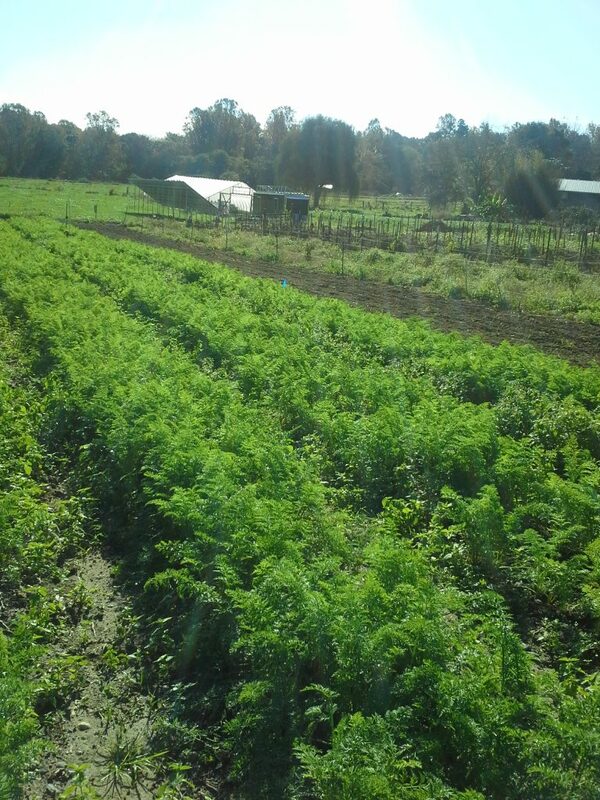 The brassica seed mix was put together by us, and was high in mizuna, I noticed. Greenhouse with young lettuce transplants in early October. Before the weekend, we were making salad mixes using spinach from our cold frames sown on 9/8. 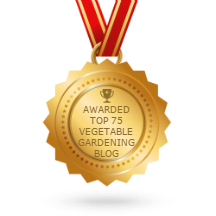 The leaves had grown very big, helped by having drip irrigation and cinder block walls as well as a slight southward slope to the soil in the cold frame, as recommended by Eliot Coleman. 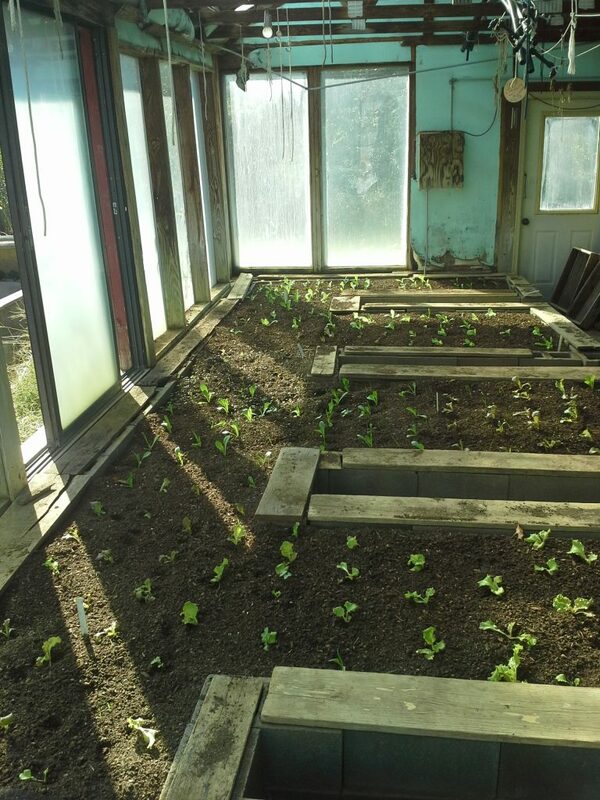 We added lettuce leaves from the plants in our greenhouse, which were sown in early to mid-September and transplanted in there early October. We will keep these plants alive all winter, just harvesting leaves. When we need the greenhouse space for seedlings at the end of January, we ‘ll start clearing the lettuce. Our home made double hoop system for holding row cover in cold windy weather. We’ve covered our outdoor lettuce mix and our last bed of leaf lettuce (still waiting for it to get to harvestable size) with row cover on double hoops. We roll the long edges of row cover between hoops on to reject hammock spreader bars. They are about 5 ft long, and by setting the hoops about 6 ft apart we have the right amount of space to comfortably roll the edges under. 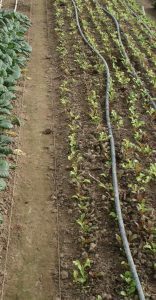 Having the row cover nice and taut over the hoops not only helps it stay in place, but also holds the row cover above the leaves and makes the likelihood of bits of row cover in your lettuce unlikely. 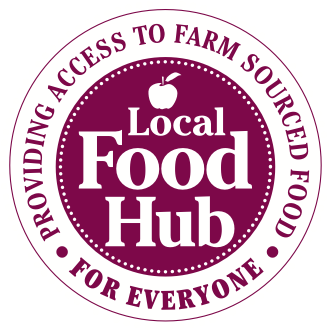 That’s the round-up on what salad we’re harvesting in October and how. Now on to this month’s planting. I already mentioned transplanting lettuce into our greenhouse. In September’s lettuce article I listed the varieties we sow for the greenhouse and the hoophouse. This month we have been transplanting those into the hoophouse. 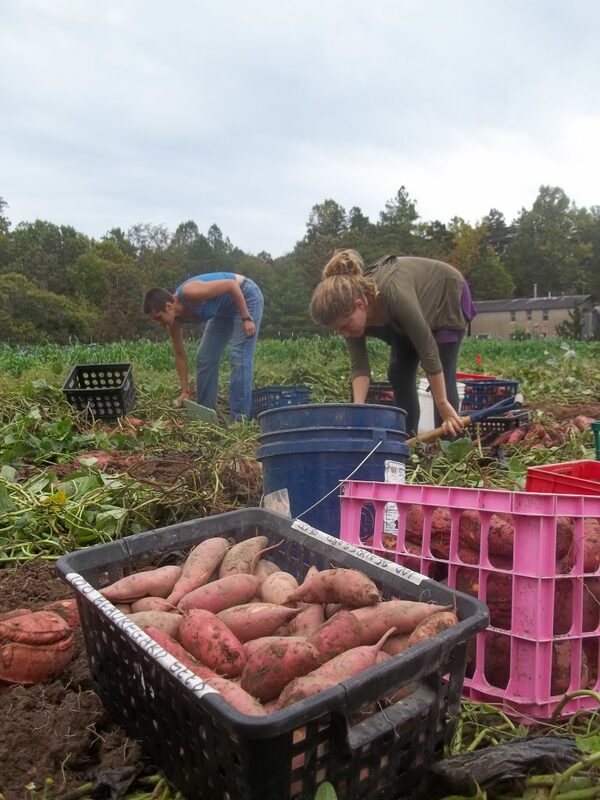 On 10/15 we transplanted the first sowing (9/15), about 230 plants at 10″ spacing in 4 rows in a 48 ft length of bed (half the length of our hoophouse). We expect to harvest leaves from these from 11/16 all the way to 3/1. Today (10/25) we are transplanting our second sowing (9/24), a similar sized planting. We hope to harvest from these from December to mid-April. 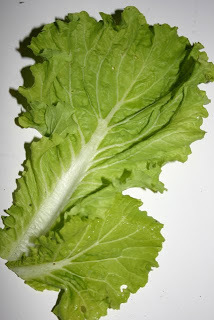 We plan to start harvesting our outdoor lettuce heads from 4/15. We have also just sown our first lettuce mix in our hoophouse (10/24). 10 rows 4.5 inches apart, 30 ft long. That will give us a lot of lettuce! We’ll get our first cut somewhere in the 12/5-12/22 range and might even get as many as 8 cuts during the winter. It will get bitter and need to be pulled 2/26-3/15. We’ll have some later sowings to take over before that happens. 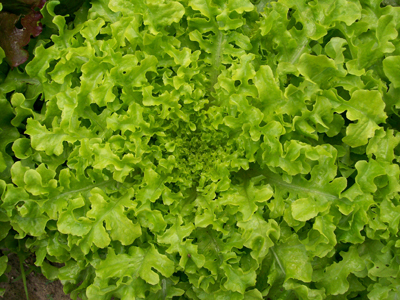 We have also just sowed some “lettuce filler” in our hoophouse. This is a small are of a few crosswise rows of the varieties we have sown to grow full-size. We’ll use the fillers to replace casualties.or if we don’t have any casualties, we ‘ll use the rows as baby cutting lettuce like our intentional baby lettuce mix. Freckles lettuce is a cheering sight in spring or fall. September is a month of change, when it comes to lettuce. We sow and transplant a lot of lettuce. The September 1 sowing is number 34 in our annual series, which runs to number 46 on September 27. In September we are normally eating lettuce which we sowed from late June to mid-July. That’s a tough time for growing lettuce here, and this year was tougher than usual. 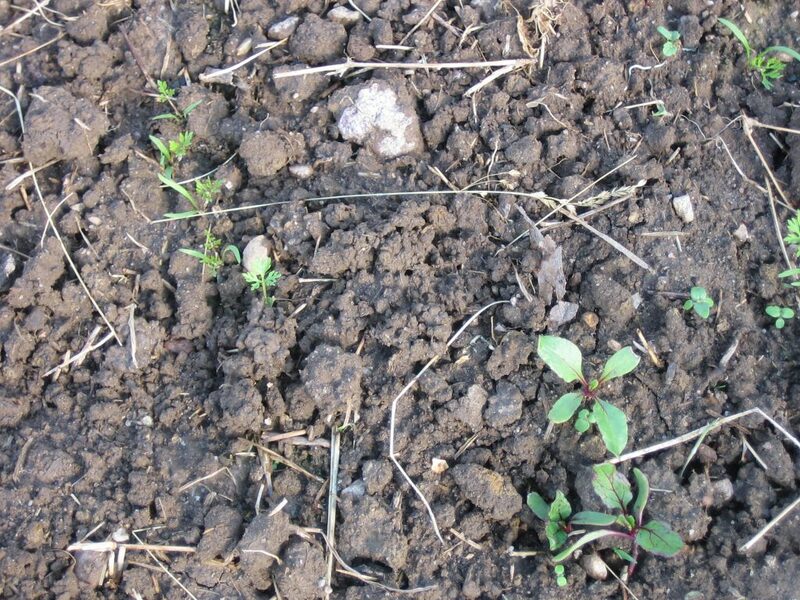 We got fine seedlings up, but then they were mowed down by cutworms lurking under the shadecloth. We started new sowings in flats, up off the ground on a frame. We tried sowing baby lettuce mix to feed us during the gap. Although we sowed it in a cooler spell, it didn’t come up. We just resowed on 9/16. Now we are having a deluge – of rain, not of lettuce! From September 1-21 we sow head lettuce every 2 days. This is because the rate of growth will slow down when the weather cools, and the harvest dates of those sowings will spread out. They will all feed us through to the spring, if we protect them from cold temperatures. 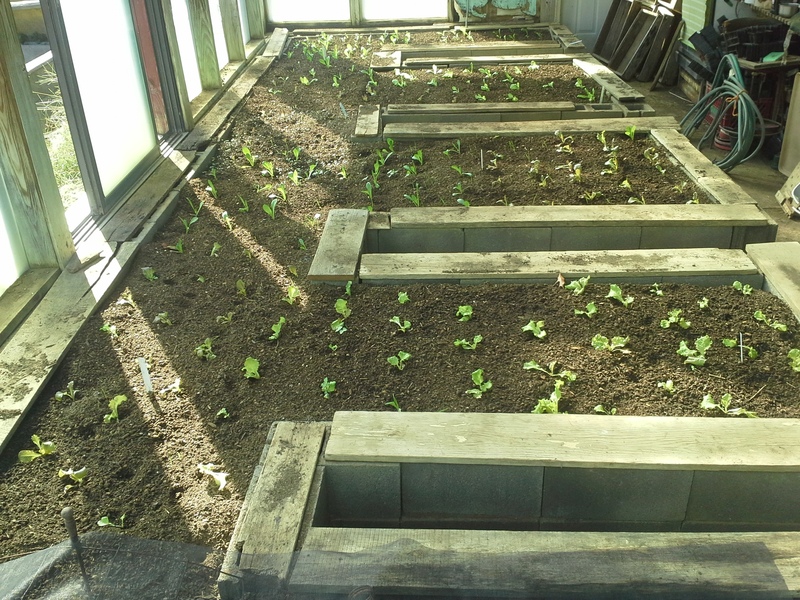 Before we got our hoophouse, we grew lettuce outdoors through the winter under double rowcover. It did stay alive, but we couldn’t harvest very often. Rowcover will provide a temperature gain of 4–6 degrees F (2.2–3.3 degrees C), depending on the thickness. It also reduces light transmission and airflow, but the trade-off can be very worthwhile. 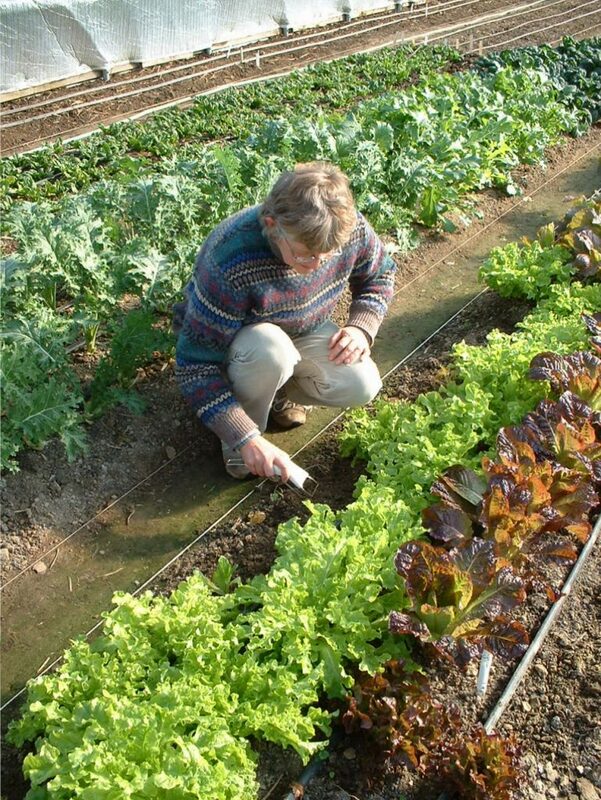 Lettuce can survive an occasional dip to 10°F (–12°C) with good rowcover outdoors — but not 8°F (–13°C), as I’ve seen! 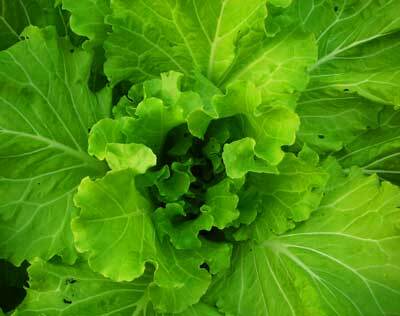 Adolescent lettuce are more cold-hardy than full-sized plants. Digging compost into our cold frames in preparation for fall planting. 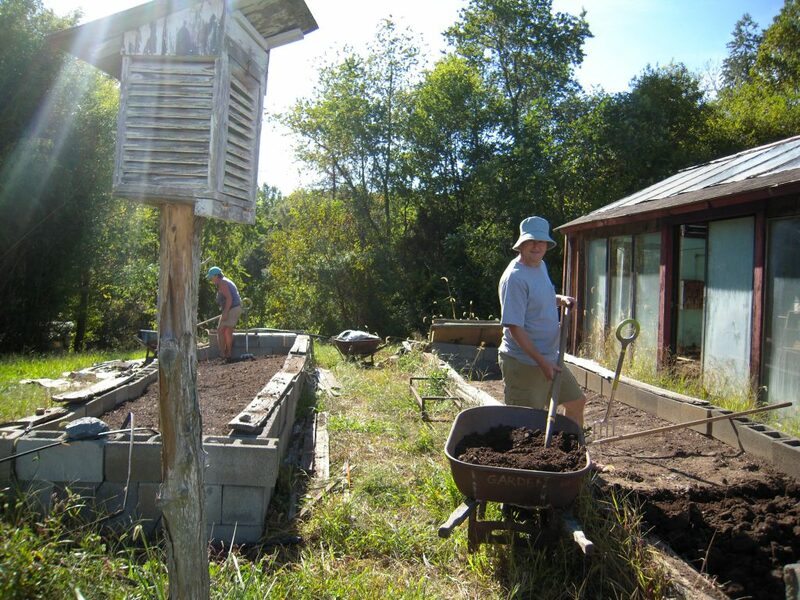 Sowings in the first week of September are for planting in cold frames in central Virginia. These days we have switched to growing spinach all winter in our cold frames, rather than continue these lettuce plantings. We get better value from spinach. It grows faster than the outdoor (rowcovered) spinach, but slower than our hoophouse spinach.This means that after the last sowing for transplanting outdoors, on August 29, we get a short break on lettuce sowing. October greenhouse with transplanted lettuce. We resume with number 38 on September 9. 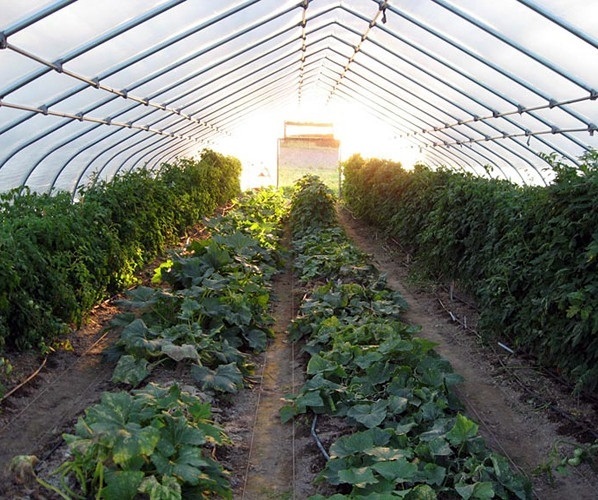 The sowings from 9/9 to 9/17 will be transplanted in our greenhouse. We also sow on 9/15 and 9/24 to transplant into our hoophouse. The sowings from 9/19-9/27 are “insurance plantings” in case something goes wrong with an earlier [planting, or we don’t get the greenhouse beds refilled with compost soon enough, and want smaller plants. 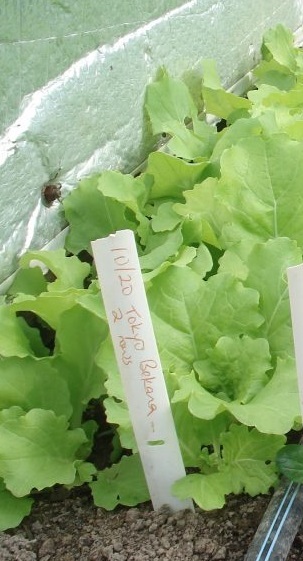 Lettuce varieties to plant in September. From September 1-7, (the coldframe ones we used to grow), we use cold-hardy varieties Green Forest, Hyper Red Wave, Merlot, Midnight Ruffles, New Red Fire, Oscarde, Panisse, Pablo, Red Salad Bowl, Salad Bowl, Winter Marvel (a Bibb) and Winter Wonderland (Romaine). Pablo is a hold-over from the summer Batavian lettuces. 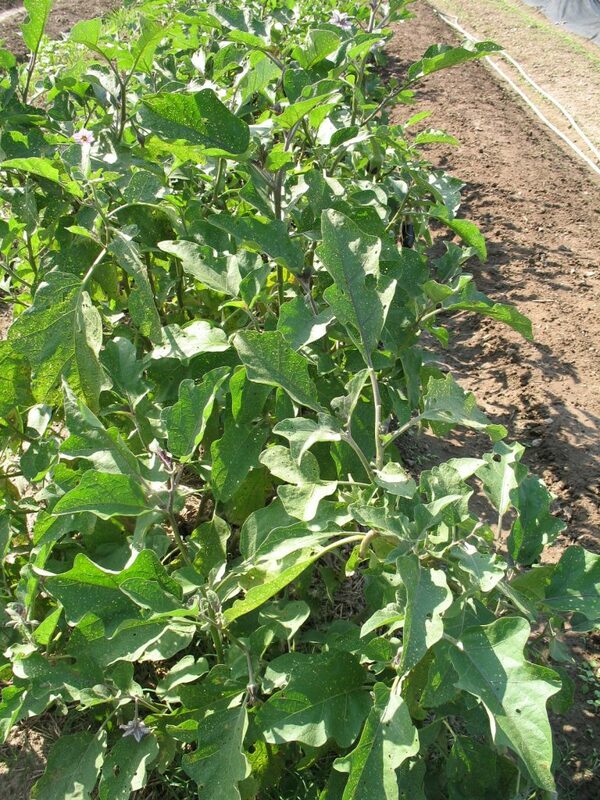 (Heat-tolerant varieties also tolerate cold.) 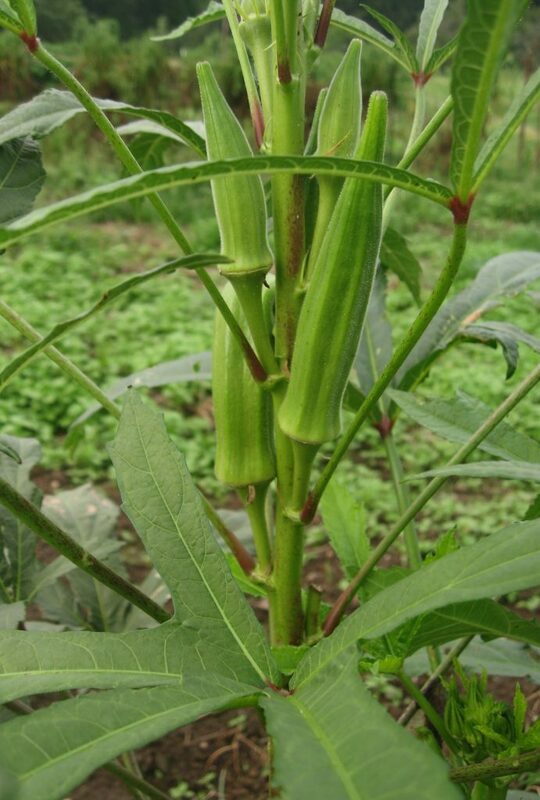 There are also specialized cold-hardy varieties that do not tolerate heat (because they have a relatively low water content). Sow these in fall and winter only. The salad bowls do fine in the greenhouse and the hoophouse, although I remember they are not cold-hardy enough for growing outdoors here. During the winter we will be harvesting lettuce by the leaf, rather than cutting heads. Green Forest, Kalura and Winter Wonderland are romaines that do well in the winter for us. Note that we don’t grow butterhead lettuce (bibbs) after the end of August. Once we reach September 8, we are sowing lettuce for planting in the (unheated) greenhouse. We use Green Forest, Hyper Red Wave, Kalura, Merlot, Midnight Ruffles, New Red Fire, Oscarde, Panisse, Red Salad Bowl, Red Tinged Winter, Revolution, Salad Bowl, Tango and Winter Wonderland. 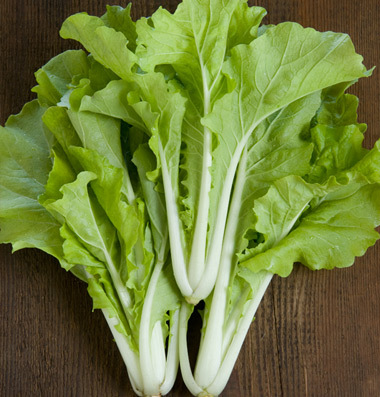 For the hoophouse winter lettuce, we sow Osborne multileaf lettuce types (Multigreen 57, Multired 4, Multired 54), Green Forest, Hyper Red Wave, Merlot, Oscarde, Panisse, Red Tinged Winter, Revolution, Tango, Red Salad Bowl, Outredgeous, Salad Bowl, Winter Wonderland Romaine. 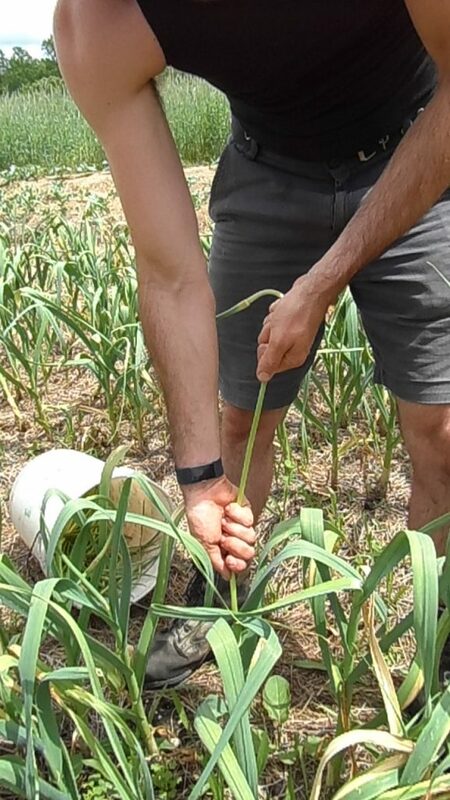 For the second sowing on 9/24, we use Include all the same ones except Oscarde, which has given us trouble in the past when started that late. Small and medium-sized plants of Marvel of Four Seasons, Rouge d’Hiver, Winter Density, and Tango can take 15F (-9.5C). 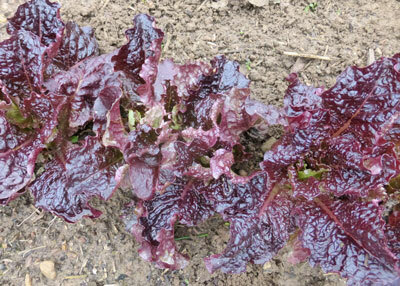 I’ve seen some small unprotected lettuces survive down to 5F (-15C) – Winter Marvel, Tango, North Pole, Green Forest. 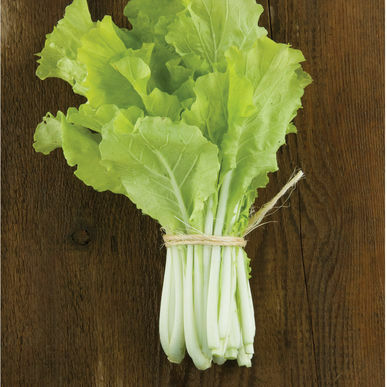 Other particularly cold-hardy lettuce varieties include Brune d’Hiver, Cocarde, Esmeralda (a bibb), Lollo Rossa, North Pole (bibb), Outredgeous, Rossimo, Sunfire and Vulcan. 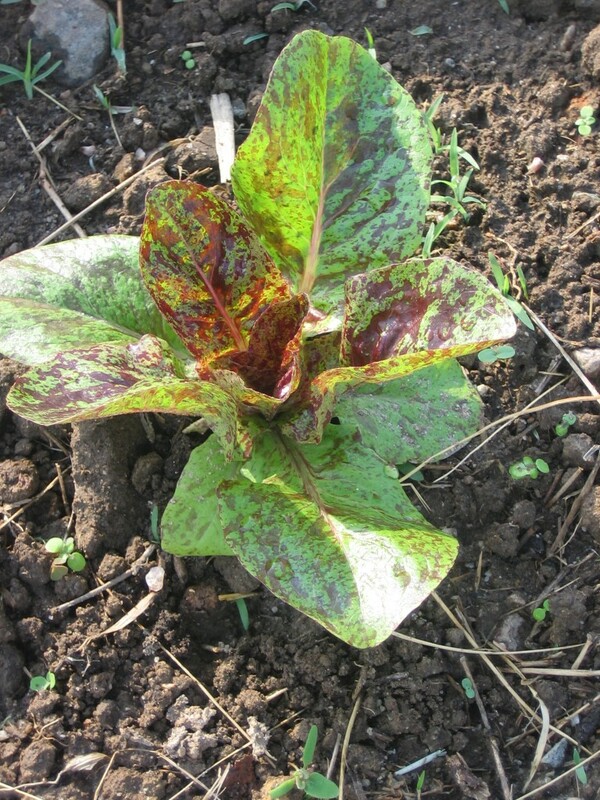 I’ll address winter lettuce in some future post. Cultivating winter lettuce in the hoophouse. 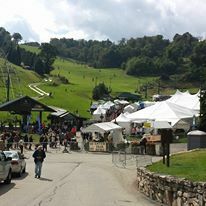 photo McCune Porter. I enjoy Charley Eiseman’s blog Bug Tracks, even though I’m nowhere near in his league of paying attention to insects. It’s inspiring to read his posts! 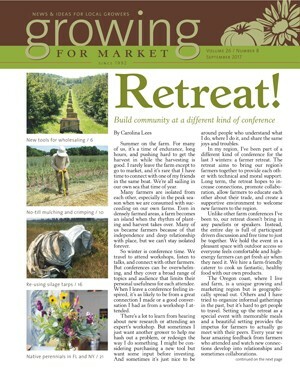 This week he wrote about Gray Hairstreak caterpillars as bean borers.